St. Pachomios was born in 1840 on the island of Chios in the village of Elaia. His birth name was Panagiotis Arelias, and having been born in the wake of the great massacre by the Turks of the Greek population of Chios in 1822, many residents remained miserable and impoverished, seeking a better life in Constantinople, which was then a center of commerce. In Constantinople, the young Panagiotis one day found himself held in prison by the Turks for murdering a Turkish rival, although he was on the defensive. During the endless hours of despair and remorse in prison, and in fear of being put to death, terrified Panagiotis found refuge and comfort in his Orthodox faith. There he continuously prayed to the Theotokos to release him from the death penalty and imprisonment to live a life of repentance. Having been released from prison, two priests counseled him to find his repentance by going to Jerusalem. He was tonsured a monk with the name Pachomios at the age of twenty-two at the Holy Lavra of Saint Savvas in the Holy Land. There he lived in strict prayer, fasting and study, repenting completely of his crime, and acquiring a deep knowledge of heavenly mysteries by his acquisition of all the virtues. He returned to Chios in 1865 and founded the Skete of the Holy Fathers on Mount Provateiou. Attracting many men and women to the revitalized monastic life in Chios, he also established the female Parthenon of Saints Constantine and Helen in the Frangovryni region. St. Pachomios never ceased studying the sacred books, and seeing the value of such knowledge he established a majestic library in his Skete. Despite his own meager literacy he authored the book Defense of Truth, in which he recalls the deadly sins and teaches about the salvation of the soul. On October 14, 1905 the pure, humble and merciful St. Pachomios fell asleep in the Lord. By the life and example of this modern Saint, we are taught that we can emerge even from the most terrible of sins and attract God's mercy through sincere repentance. He has not been officially canonized yet, but is honored as a Saint by the monasteries he established and in the consciences of many believers. 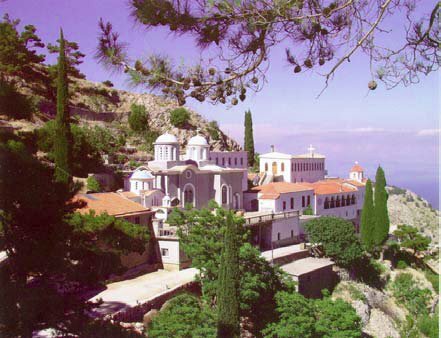 St. Pachomios and the Monastery of the Holy Fathers in Chios served also as an inspiration to both St. Nektarios the Wonderworker (+ 1920) and St. Anthimos of Chios (+ 1960). In 1866, at the age of 20, Anastasios (the future St. Nektarios) went to the island of Chios, where he was appointed a teacher. Meanwhile he would visit the newly established Skete of the Holy Fathers with Elder Pachomios, his spiritual father. After 7 years, he entered the Monastery of the Holy Fathers under the care of the venerable elder Pachomios. After 3 years as a novice Athanasios was tonsured a monk and given the name Lazarus at Nea Moni in Chios. A year later he was ordained a Deacon and received the name Nektarios. Elder Pachomios and a wealthy local benefactor then convinced the young monk to complete his high school studies in Athens. In 1888, at the age of 19, Argyrios (the future St. Anthimos) visited the Monastery of the Holy Fathers. He received a blessing from Elder Pachomios to live a monastic life when he was to return home, since his poor parents and village required his aid. After a time he retired to the Monastery, and it was here that he became a monk and took the name Anthimos given by Elder Pachomios. He fell ill there and his abbot sent him home to his parents for the sake of his health. In 1909, at the age of forty, he received the Great Schema by the successor of Pachomios, Hieromonk Andronikos. - This alone, O Lord: Enlighten me to know Thy will, and grant me the strength to perform it. Woe is me, the foul and impure one. - Christ accepts whatever good you do unto your brethren as if done on His behalf. - Whoever hears someone speaking against a brother behind his back and then goes to make it known shall not be forgiven either in this life or the next. - Always humble yourself and do not justify yourself; throw the blame upon yourself, and you will find peace. - Do your prayer rule with great care. - Live in simplicity: that is, if someone insults you, bear it; or if you are reviled or humiliated, do not retaliate or bear malice. - Be rounded [i.e. do not have rough edges to your character]. - I must beseech God with humility to protect me and I ought not believe my thoughts. - Preserve the attention of your mind. - Attention is called the keeping of the mind, guarding of the heart, vigilance, and noetic quietude. - When you pray, comprehend what is being said. - Exercise restraint, which is superior to silence. Restraint is not to laugh, and not to speak idly or ill of others. - Nothing so helps one flee from sin as remembrance of death. - Virtue without humility is not virtue. - Whatever you do, if you do not have humility and, especially, love, it amounts to nothing. - Humility is to have no rancor with anyone. - We must always say the Jesus Prayer, wherever we may be. - When you reproach yourself, have no fear of going astray. - Not my own will, but that of my Lord. - I must always be ready for death; I should live as if it were the last day of my life. - I should say the Jesus Prayer humbly, as if into His ear. - I must always give preference to my elders. - I must cut off my will: when the thought occurs to me to look at something, I should not look, or when it tells me to say something, I should not say it. - I should unceasingly reproach myself. - When they praise you, do not believe them; for they are imprecating you. - It is impossible for God not to show mercy on one who is genuinely striving to be saved. 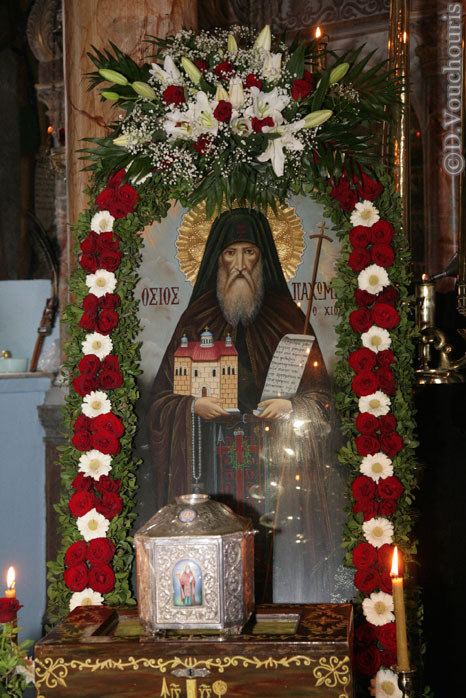 Antonios N. Charokopos, Elder Pachomios: Founder of the Skete of the Holy Fathers in Chios (Athens: 2003), pp. 189-194.